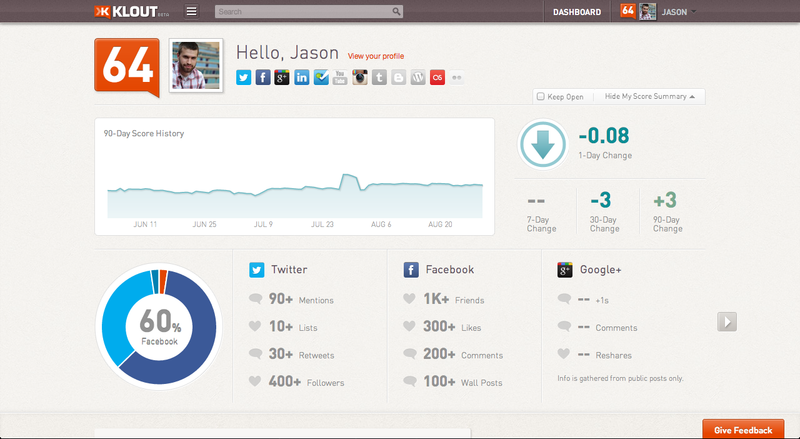 It’s quite a face-lift from the previous version of Klout…in fact, it’s almost completely different. But, before I kick into that review, I’ll like to talk a little bit about what goes into your Klout score. Basically, you’re ranked on a scale of 1-100 with the average user coming in at about 40. 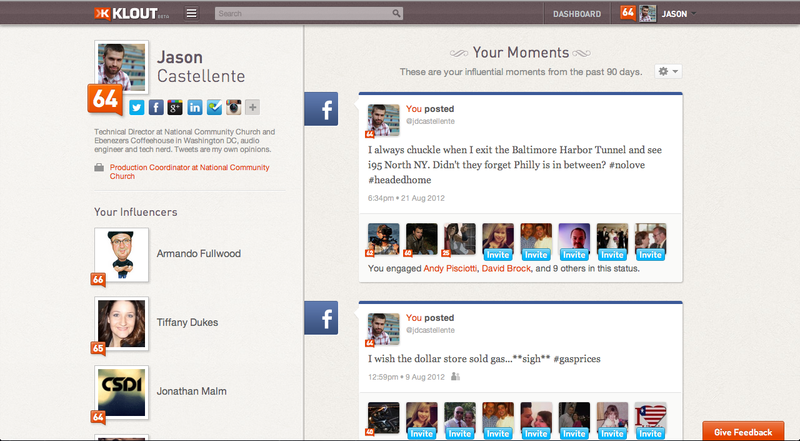 (My Klout score is about 60 at this point…hehe!) The higher you get, the harder it is to raise your score which explains why you don’t see many Klout scores that are sky high. Also, you can’t raise your Klout score by simply generating more content or getting more followers. You have to generate contant that people want to talk about and engage follows who are interested in what you have to say. And the more influential you are, the more chances you have to get recognized in the social media universe and even the potential to get free stuff. In fact, I’ve gotten a $10 Visa gift card as part of a T-Mobile 4G promotion as well as free Lipton Tea. However, some people have event gotten free plane tickets amongst other things. If you want to see exactly what parts of your social media accounts Klout monitors and is included in your Klout score, check out: http://klout.com/#/understand/score. This screen gives me not only important information about my influence across the various social networks but also gives me a graphical interpretation of the information. If you look at the graph above, it gives me a 90-day history of my Klout score as well as a circle/pie graph that shows what percentage of my influence comes from where. If you scroll down or click the “hide my score summary” tab located at the top right side of the page and you’ll see your social interactions from the past 90 days and you’ll see a ranking in the form of “green lights” to the top right of the post. Another section of the website outlines moments where you were most influential over the past 90-days. It basically arranges your posts in order of how much it influenced your followers. Below the post, you will see the profile picture of who you influenced and also either their Klout score or a button where you can easily invite someone to join Klout. On the left sidebar, it also lists who your most influential followers are. 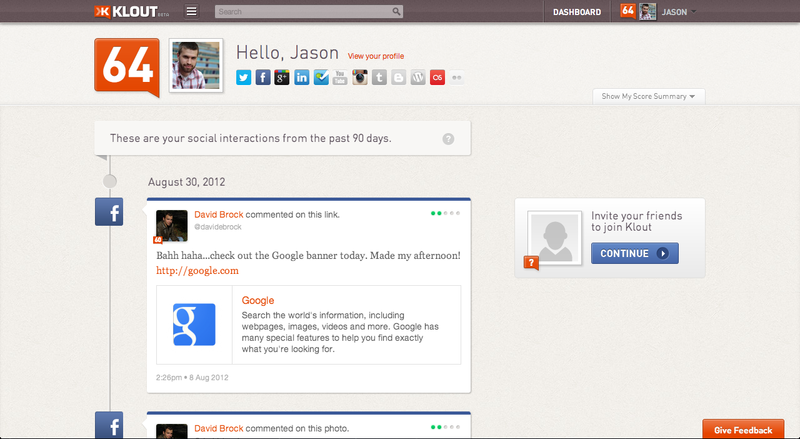 Personally, I’m a huge fan of the new Klout website. Hopefully, they will keep adding new options and features to the site. One thing I’d like to see is update and post scheduling for each social network that is connected. That way, not only can you see what, where and how you’ve been influential but you can use Klout to increase your influence based on the information Klout gathers. 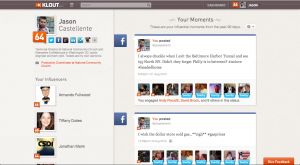 What else would you like to see on Klout? 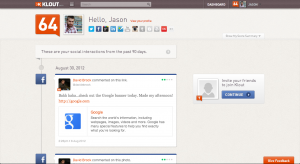 For those who have used the new Klout preview, what do you like or dislike on the site? Do you think Klout will become more or less prominent in social media in the months and years to come?